Ministry of Development of North Eastern Region (DoNER), Government of India is organising an event “North East Calling” under its Destination North East series of this year. The two-day (9th-10th September) event will be held at India Gate lawns in Delhi from 11.00 AM to 10.00 PM. The entry for the general public is free. 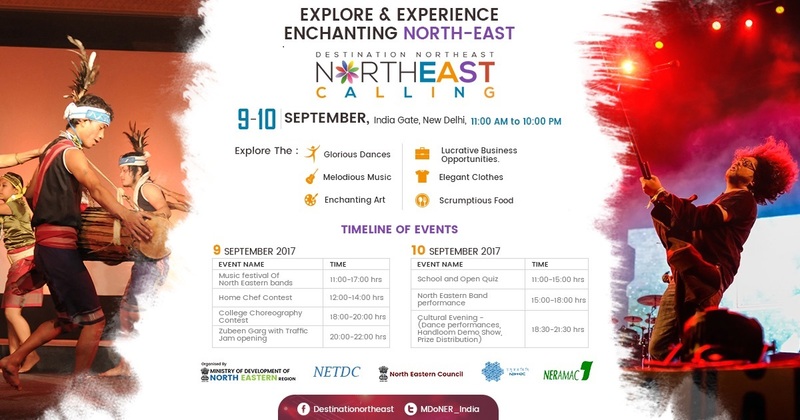 The purpose of the event is to promote the art, culture, heritage, cuisine, handicrafts, business and tourism of North East India. The event will showcase all activities and products of North-East and it coincides with the 16th Anniversary of Ministry of DoNER.